A recent pedestrian-car accident in Massachusetts on Newport Avenue injured both parties involved, according to the Patriot Ledger. The male driver and the female pedestrian were both transported to Boston Medical Center after the collision. Quincy police Sgt. Richard Gilmore reported the van was heading north on Newport Avenue when it swerved off of the roadway, hit the side of the ramp that runs from West Squantum Street and Newport Avenue and collided with the pedestrian. The cause of the accident is still being investigated by local officials. 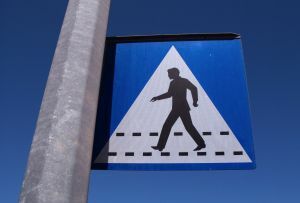 As we recently discussed on our Boston Personal Injury Attorney Blog, residents and visitors of the state of Massachusetts are asked to make pedestrian safety a top priority in 2012. Our state sees far too many pedestrian accidents each year, most of which are completely preventable. According to data from the Governors Highway Safety Association, there were nearly 50 pedestrian fatalities in the state in 2009. Preliminary data for 2010 pedestrian accidents indicates there were approximately 30 pedestrian fatalities during the first 6 months of the year. The number of pedestrian fatalities from the first six months of 2010 was higher than the number of pedestrian fatalities from the first six months of 2009. As we recently reported, Boston is ranked as one of the most dangerous metropolitan areas in the country in terms of traffic-related fatalities and injuries. Boston ranked in as the 52nd most dangerous of these areas nationwide. Statistics reveal that there were nearly 500 pedestrian fatalities that occurred in the city from 2000 to 2009. Clearly, more needs to be done around the state to help our pedestrians become safer. -Pedestrians are required by law to obey traffic control signals and instructions from police officers who are directing traffic. -Traffic Control Signals: “Walk” – pedestrians may proceed across the roadways, after looking both ways for incoming traffic. A flashing “Don’t Walk” – no pedestrian shall start to cross the road and any pedestrian who is currently crossing the road may push on to finishing crossing quickly. A steady “Don’t Walk” – no pedestrian is allowed to start crossing the road. -Pedestrians are required to use a crosswalk to cross a street if they’re within 300 feet of one. -Pedestrians are required to yield the right-of-way to authorized emergency vehicles and funeral processions, regardless of what the traffic control signals display. -Pedestrians should always wear brightly-colored clothing to help ensure they’re seen by passing motorists. -Motorists must always yield to a pedestrian using a crosswalk. -Motorists are not allowed to block crosswalks. -Motorists must slow down for pedestrians. -Motorists are prohibited from opening a car door into the travel lane of a bicyclist or a pedestrian. If you or a loved one has been injured in a traffic-related pedestrian accident in Boston or elsewhere in Massachusetts, contact Massachusetts Personal Injury Lawyer Lawyers Jeffrey S. Glassman for a free and confidential appointment to discuss your rights. Call 1-877-617-5333.